For a limited time, redeem AA miles for flights to Hawaii for just 15,000 miles each way. 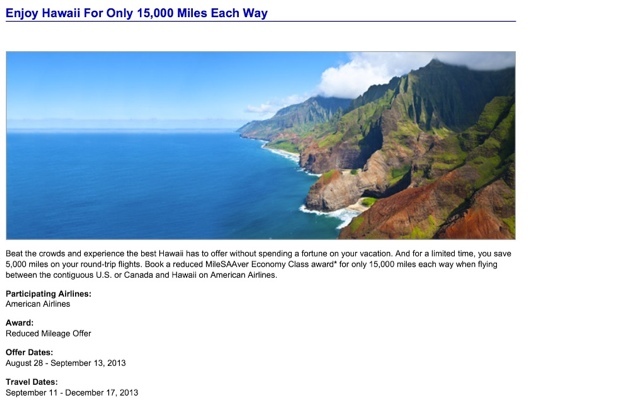 *This award special is valid for travel on flights marketed and operated by American Airlines between Hawaii and the U.S. or Canada, excluding Alaska and the U.S. Virgin Islands, for MileSAAver Off-peak Economy Class award. Award inventory is subject to seat availability and capacity controls, and seats for award travel may not be available on all flights. Standard AAdvantage award travel terms and conditions apply. AAdvantage flight awards are subject to, and the passenger is responsible for, the September 11th Security Fee, applicable departure taxes, federal inspection fees, passenger facility charges and any other taxes and fees imposed by a government entity (U.S. or foreign), as well as any carrier imposed fees or surcharges. View complete details on award reservations. View complete details about the AAdvantage program.